Looking for the best pressure cooker for canning? You’ve come to the right place. Canning is probably the best way to preserve fruit and vegetables so that you can eat them anytime you want, no matter the season. Whether you want blueberries in the winter or pumpkin in the spring, having a pressure canner means you can preserve almost any kind of food in canning jars and enjoy it anytime you like. That’s why pressure canners are proving themselves to be incredibly useful and popular appliances for any home! Pressure canners come in multiple sizes, prices, features, and functions, and when faced with the plethora of quality options we’re left with one burning question – what is the best pressure canner? We’re here to alleviate some of the burn to your question, so keep reading to find out! When it comes to canned food, this pressure cooker by All American is the best choice on the market. It’s noted for its large carrying capacity, accommodating containers in the 19 pint or 7 quart range, includes an easily readable pressure gauge, and a three-setting pressure regulator valve complete with 5, 10, and 15 psi settings optimum for your canning needs. Regardless as to whether you’re an expert in the kitchen or as novice as they come; the All American Quart Pressure Canner is known for its ease of use for cooks of all levels! The included instruction manual is primed to walk you through the “Do’s” and “Don’t’s” to have you safely and efficiently operating the canner in no time. In terms of safety, it also features two automatic venting features to prevent the buildup of excess pressure. Ever get so hungry that the last thing you want, or have the patience, to do is cook a cumbersome meal. This pressure canner allows you to easily can your favorite stews, meats, veggies, and other foods, and cooking hungry becomes a thing of the past. Just pop the top off a can and dinner is ready! Cook hours, days, or weeks in advance granted you follow the proper storage techniques according to your food. 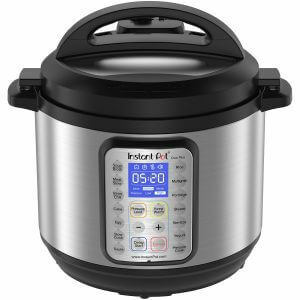 The size and build of this pressure cooker mean its hefty enough to perform the demanding task of canning, while still fitting quite nicely in practically any kitchen environment. 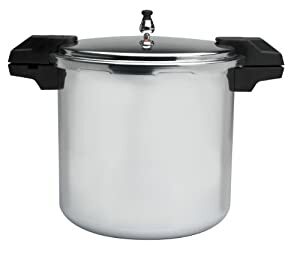 Users who own the All American 921 21-1/2 Quart Pressure Cooker/Canner have remarked its consistent and quality performance even two years after purchase and use. In addition to its consistency, the All American Pressure Canner also comes in six different sizes to choose from – the 10, 15, 21, 25, 30 to 41-quart sizes, specially designed for canning according to different batch sizes. Based on our research, this pressure cooker deserves the top pick rating. Presto offers a quality and competitive 23-quart canner for an incredibly reasonable price. A well-known brand that has been in business since 1905, Presto has gained the confidence of people from all over, and its 23-quart canner is no exception, especially given the fact that it doubles as both a pressure cooker as well as a pressure canner. 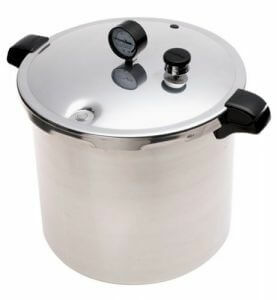 This 23-quart pressure cooker comes with a handful of notable features, including plastic handles specially designed to stay cool to the touch throughout the canning process, a firm locking lid to prevent seepage, as well as a pressure regulator and the easy-to-read dial gauge that work together to prevent the build of excess pressure and damage that could follow. In addition to these things, the steam gauge allows you to control the pressure accurately, and the included manual and recipe book will have you set up and cooking in no time. This pressure canner also doubles as a boiling water canner and food preserver optimum for preserving fruits, jellies, jams and much more. The design works so that racks easily fit into the pot to keep the jars up off the bottom. Once steam is released, it is kept in by using the lid locks supported by inner sealing rings. The 23-Quart Aluminum pressure cooker from Presto is a warrior in your kitchen. It cooks food rapidly while preserving ton of flavor lost in alternative methods like a microwave. The Presto 1781 Aluminum Pressure cooker seems to have everything one needs for pressure cooking and canning. It’s big, it’s safe, and it’s affordable! 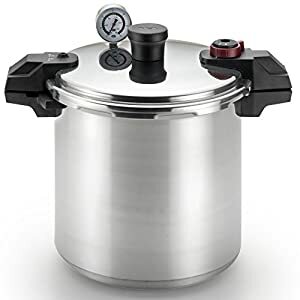 Furthermore, this pressure cooker stays economically friendly given that with its substantial durability it still comes at a very reasonable price. The Presto pressure canner is a great choice for those looking for a fast heating device, as well as those who want to preserve their fruits, jams, jellies and any other low- acid foods. The Mirro 92122A cooker is a high volume cooker that is capable of holding up to 16-pint jars or 5-quart jars in one go. It offers three pressure options and comes complete with a ten-year warranty. The sure-locking lid system prevents spilling and accidental opening of the pressure canner. Comes with a side gasket for safe pressure release. Pressure control allows the user to choose between three options. 5, 10, and 15 psi (pounds per square inch). The rubber gasket that fits on the inside of the lid assists in pressure build-up while preventing pressure escape. The safety window releases excess pressure in case of vent tube blocks. Excess pressure is safely released automatically by the side gasket. Tight locking lid that won’t be dislodged when the pressure builds high. The heavy-gauge aluminum body ensures uniform heating and a great pressure build. The cooker uses a gasket for pressure release, known sometimes to break loose or impact pressure build up. The T-Fal polished pressure canner comes with two canning racks allowing it to perform at a large capacity and making it capable of holding seven quart-size jars or 16 pint-size jars when double-stacked. The T-Fal Cooker is also UL certified due to its notable built-in safety measures. • Pressure control with three selections: 5PSI for vegetables and delicate foods, 10PSI for meat, and 15PSI for canning. 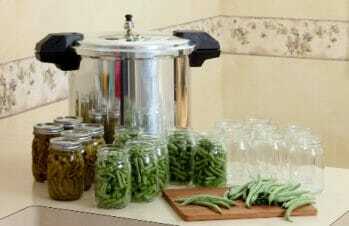 • Two canning racks to prevent food sticking and maximize canning space. • The spring safety device ensures no pressurization happens apart from the lid first being locked. • 5 point security system that includes: sure-locking lid, vent tube for pressure release, and a built-in pressure monitoring device on the handle makes it safe to use. 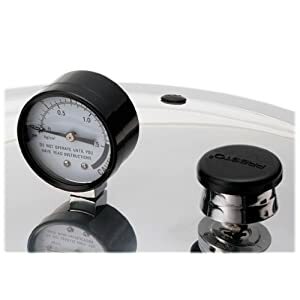 • The pressure gauge dial enables users to monitor the level of pressure. • The sure-locking system ensures that the lid cannot open when the cooker is pressurized. • Two food racks eliminate food sticking while increasing holding capacity. • Its high-gauge aluminum make means it’s durable and rust resistant. • Some of its parts require periodic replacement. 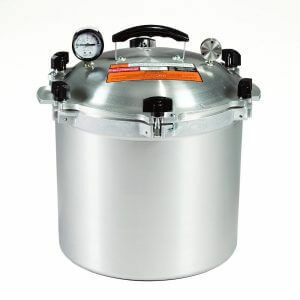 A Pressure Canner is an important piece of equipment that can be used to preserve low-acid foods such as vegetables, meat and much more. However, if you’re new to pressure canners or looking to buy a new one, you’ve likely got tons of questions: What should I look for when buying a pressure canner? Which pressure is canner most accurate? How do I choose a pressure canner? How do I even use a pressure canner? All the information about the various types of pressure canners and the features involved with them can often leave us overwhelmed and confused! We figured it’d be a good idea to spare you some time and headache usually involved in the search for answers to these questions, and compile them all for you here in one place! 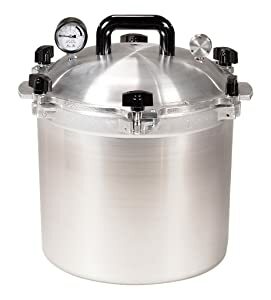 What to consider when buying a pressure canner? The vast majority of pressure canners are either made of aluminum or stainless steel, and each has their advantages and disadvantages. For instance, one of the major reasons aluminum is often the material of choice is because it is less expensive than stainless steel and fairly lightweight. However, it also tends to not last as long when compared to one made of stainless steel. On the flip side, a stainless pressure canner is often incredibly durable. However, stainless isn’t the best conductor of high temperatures, so heat isn’t always distributed as well as you’d experience with an aluminum cooker. It will depend on your needs, but if you intend to use the pressure canner for a long time, a stainless steel option may be worth the investment. The second factor to consider is the capacity of food that the pressure canner can support, If you’re planning on just using one for home use, pressure canners from 16-quart to 23-quart are likely to suit your needs. Larger capacity pressure canners are available, but they are generally overweight, cumbersome, and require a fair amount of maintenance. Smaller sizes (below a 14-quart capacity) are usually intended for cooking other than canning, so make sure to have a thorough understanding of what your canning needs are before making your purchase. 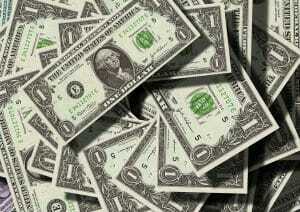 One of the most important considerations to make before purchasing your pressure canner is your budget. You’ll want to be doing a fair amount of comparison between the listed price, your budget, and the features a pressure canner comes with to make sure you’re getting the biggest bang for your buck. As expected, cheap isn’t always the better option, but you also don’t want to pay for features you realistically won’t utilize, these are all some things to keep in mind as you consider which route to go. Benefits of a pressure canner? Pressure canners save energy! Utilizing a pressure canner can mean far less time spent on preparing meals which, in turn, saves you money since you won’t have a plethora of appliances running up your energy bill. Accordingly, pressure canners also save you loads of time. Less time slaving over a hot stove, and more time devoted to doing something far more enjoyable. Pressure cleaners often require minimal cleanup and maintenance. Traditional cooking usually requires tons of oils and can make a real mess in the process. A pressure canner, however, has a well-secured lid that prevents splashes, and at most you’ll only have to wipe down one appliance. How to use a pressure canner? Make sure all vent pipes aren’t clogged by any material or calcium deposits. Blockages are a huge no when it comes to pressure canners. Center the canner above the burner. Position the rack and warm water into the canner. For hot jam-packed foods, you can bring water to 180°F in advance. For raw, filled foods, water should only be taken to 140°F. Use the jar lifter to place the jar on the jar rack in the canner. If your cooker uses a gasket, ensure it is carefully in place before locking the cooker. Fasten the canner cover securely and leave the weight from the vent tube or open up the petcock. Adjust the pressure setting to suit the kind of food you are cooking. Turn the heat to its highest position until the water boils and heavy steam flows widely in a funnel-shape from the open vent tube or petcock, and allow steam to continually exhaust for ten minutes. Monitor the heat under the canner to keep a reliable pressure built up, preferably just above the desired pressure reading on the pressure gauge. When cooking is complete, switch off the heat, take away the canner from the heat source, and allow the canner cool off naturally. Releasing the pressure through the gasket can also help speed up the cooling process. When removing food, never force the cooker to open. If you encounter some resistance while opening the cooker, it means that there is still pressure on the inside, and it should not be opened until this pressure is released. What pressure should I cook my food at? General guidelines: 5PSI is for vegetables, 10PSI for meat, and 15PSI for canning. 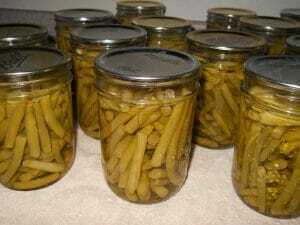 Home canning is becoming increasingly popular, and demand for nifty appliances like a pressure canner is on the rise. Buying a pressure canner can be quite the investment, and it’s inevitable that not every product on the market will be a quality, dependable piece of equipment, and opting for a more expensive, yet dependable variety is often the better long-term investment. Perusing reviews and checking out the different ratings of the best pressure canners is a great place to start when beginning to make your decision. Utilizing product comparisons and online resources will ensure that you’ll be able to pick the one that best suits your needs, and consider favoring those that have a consistent five-star rating. The Presto pressure canner is a good example of one of these and is regarded by many reviewers as one of the most useful and reliable canners on the market. You can use it to can vegetables, fruit, fish and meat and you’ll be able to try many different recipes. The Presto Pressure Canner is a very good product and quite easy to use by anyone. The All American pressure canner, manufactured by the Wisconsin Aluminum Foundry, is another quality product. The All American canner comes with a metal-to-metal seal between the lid and the cooking pot. This eliminates the need to replace the gasket after wear and tear. The All American canners are made of heavy industrial gauge aluminum, and this brand is committed to quality by manufacturing durable canners that last for generations. Some of the other pressure canner brands on the market are Mirro, T-Fal, Maitres, and Chef’s Design. If you’re interested in home canning, but you don’t already own a pressure canner (or you need a replacement), the reviews we’ve already listed are a great place to start. As mentioned, the All American, Mirro, and Presto are usually regarded as the best brands on the market, and if you’re ready to get shopping, Amazon is a great place to start. Whether you want to purchase a stainless steel pressure canner, one made from aluminum, or you just need some canning supplies, such as canning jars or a recipe book, you’ll be sure to find them there. When shopping for pressure canners and other supplies, remember that it’s always important to buy a quality product that’s reliable and easy to use. Pressure canners are indeed a great investment that leaves you in a better position to preserve fresh vegetables and fruits without additives, thereby maintaining your health, and saving you both time and money. All in all, whatever type of canner you choose, you should first familiarize yourself with the instructions and safety precautions in the manufacturer’s user manual. Finally, the decision is yours, make sure you’ve read the instructions above and find yourself the best pressure canner that suits your needs and budget.